Nice work and thank you for the analysis! Thanks, also, for relaying the tip of freezing the butter then shredding it with a cheese grater. I’d just used a pastry cutter to mash, mash, mash it down. Thanks for this! I am actually wondering the same thing but for chinese steamed buns. Would be curious to see when rise decreases and when taste is affected. I have nothing of substance to say, just that this was an awe-inspiring exercise in food geekery that I will actually use. I’d never even thought to do a structured experiment. Bravo! This is incredible! I am in awe of your kitchen science fu. I have never been so principled about my kitchen experimentation. (Result: much more futzing around to arrive at much more heuristic recipes.) I will be sure to apply your baking powder guidelines. – I don’t fully understand the chemistry of baking powder (although Wikipedia appears to have a very nice article. 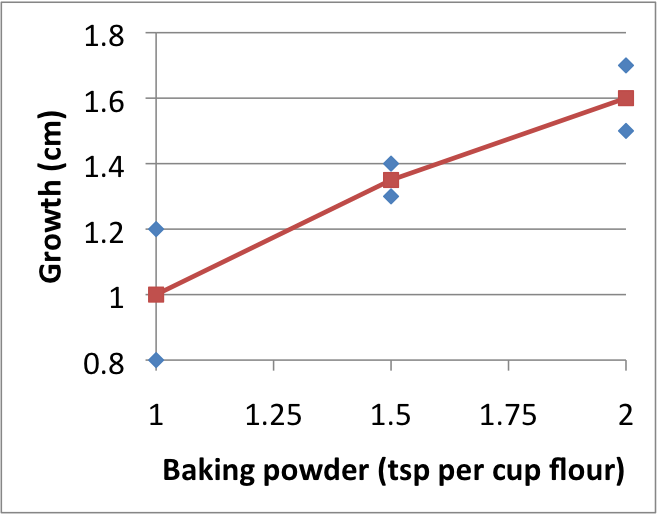 But most commercial baking powders are more sophisticated than baking soda+cream of tartar/tartaric acid. They contain an additional acid that activates at high temperature, making them “double acting”. The point, as I understand, is to cause a secondary rise cycle, yielding higher rise in the oven. Plus it desensitizes the batter from the timing a bit. – The relationship would be predicted to be linear because the amount of C02 produced by the leavening should be proportional to the mass of leavening used, up to structural constraints. I conjecture that the linearity will fail when the gas volume exceeds the structural capacity of the dough or batter (i.e., the item falls). That’s an empirical limit, however. Finally, on the construction of biscuits, I have observed a significant dependence on the form of the “rolling out” step. I have found (through non-rigorous, non-quantitative) experimentation that a process of repeated folding is important. This has some of the effect that steel folding in Katana construction or Damascus steel does — it creates a many-layered structure, with “softer” (butter) material separating layers of “harder” (flour dough) material. While it doesn’t improve the hardness or temper of biscuits, per se, this technique does yield nicely flaky layers. ;-) I have found empirically that 4-6 folds is about optimal; fewer folds yields a noticeably less layered and flaky pastry, while more folds toughens the dough as the gluten begins to develop. I have learnt something new today.